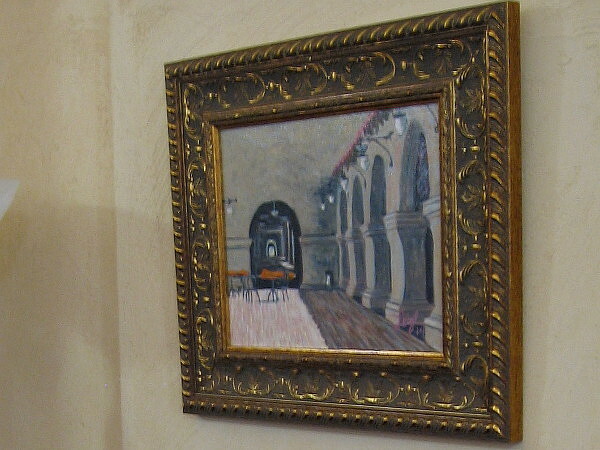 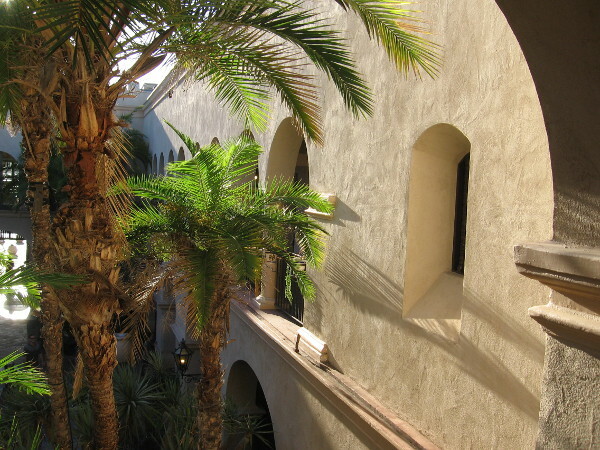 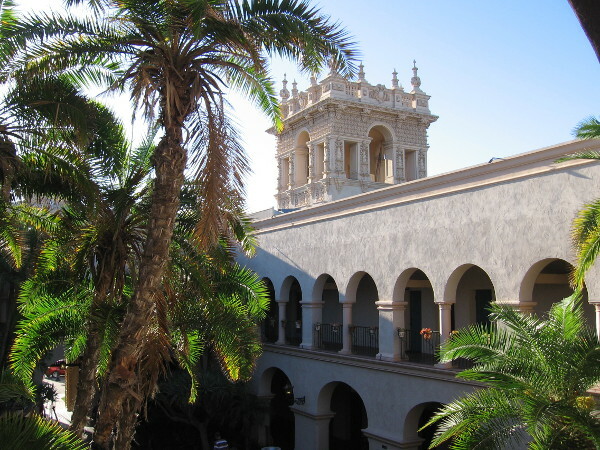 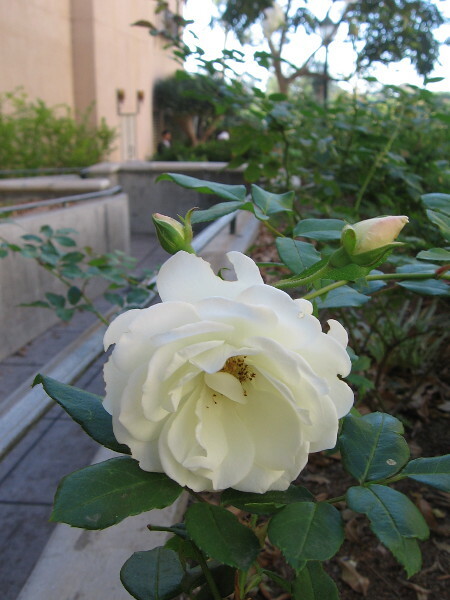 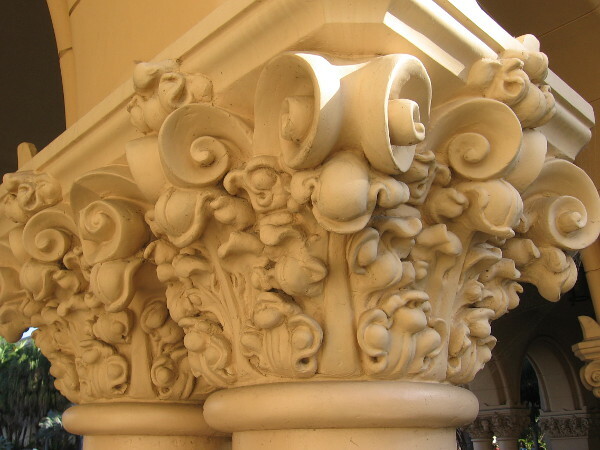 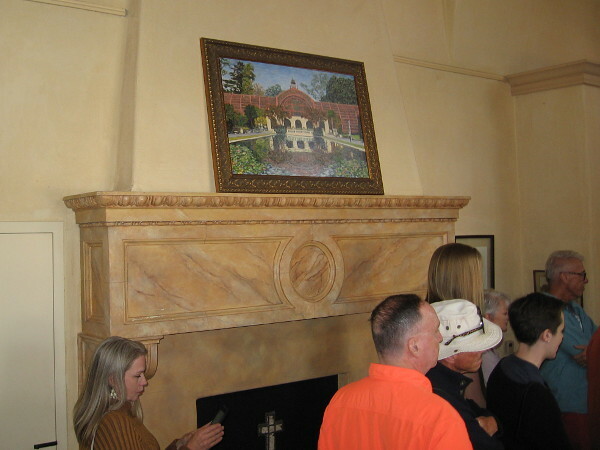 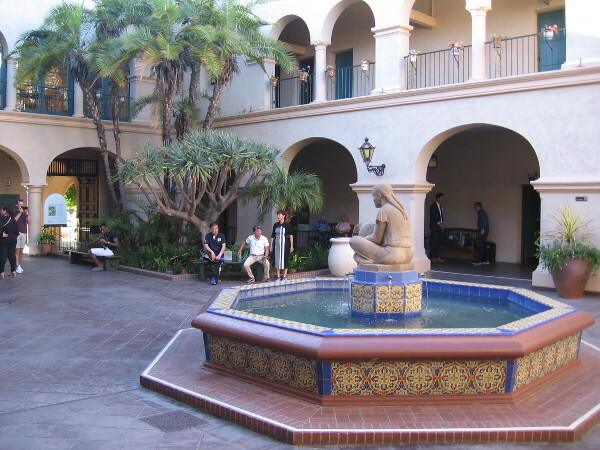 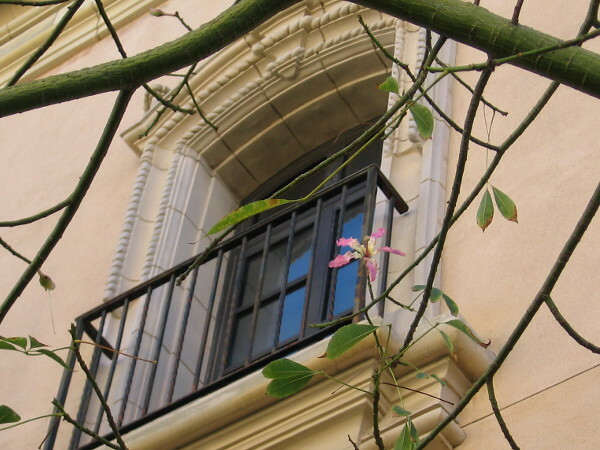 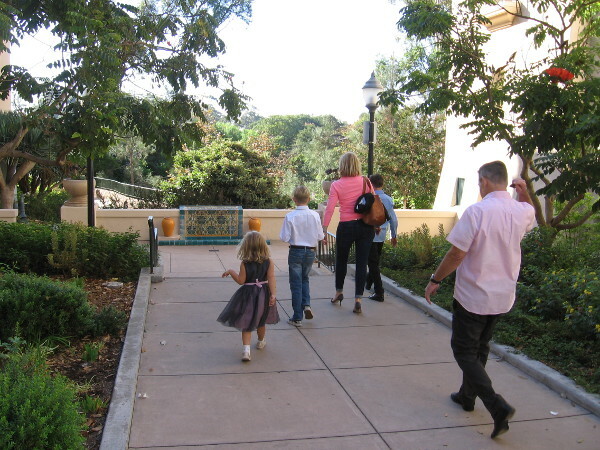 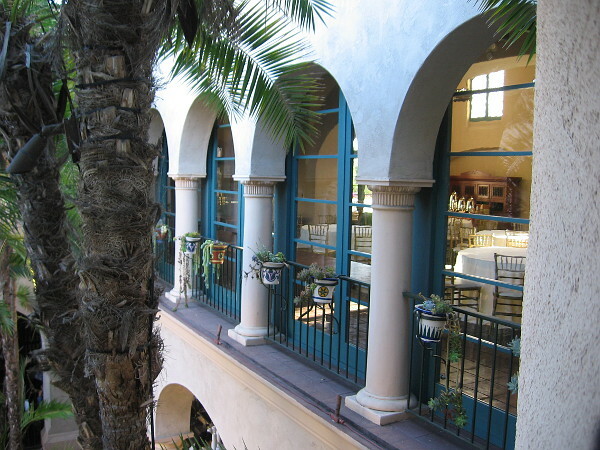 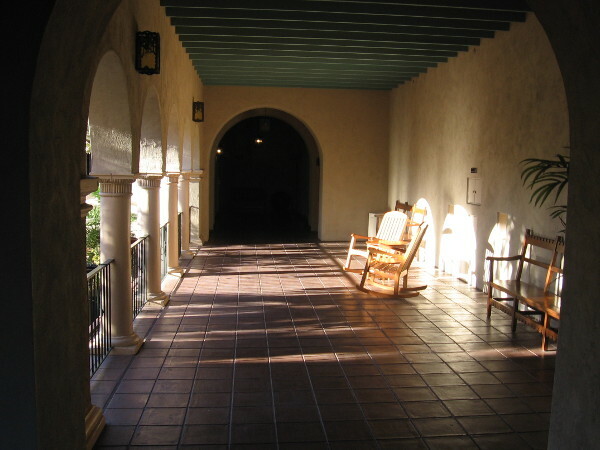 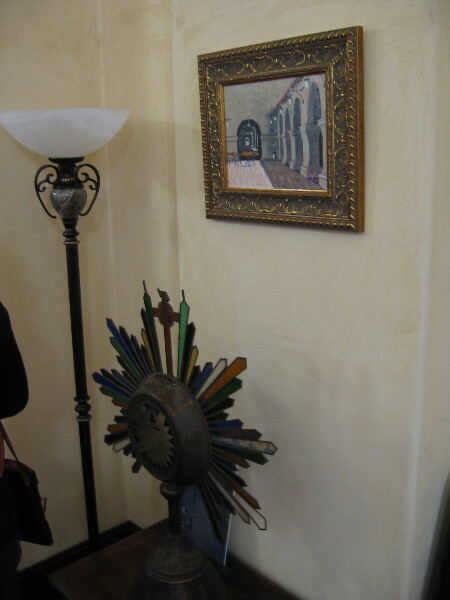 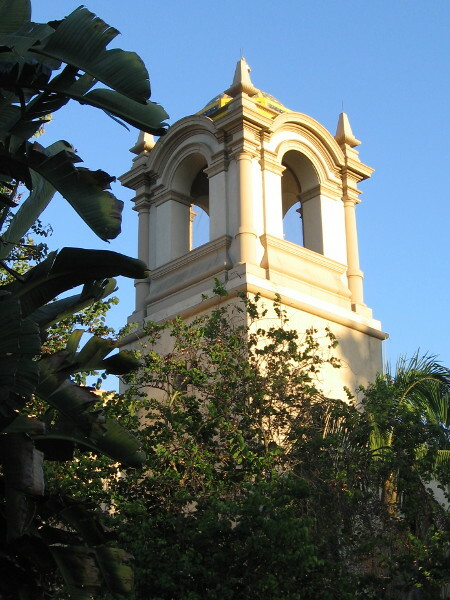 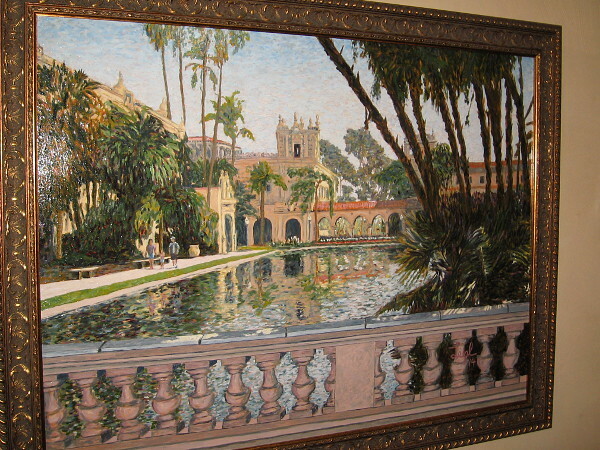 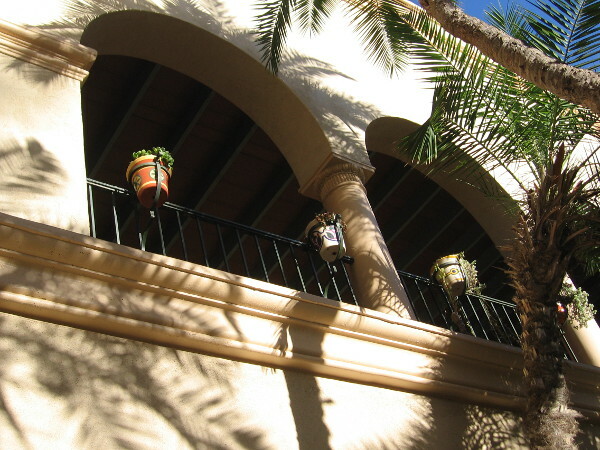 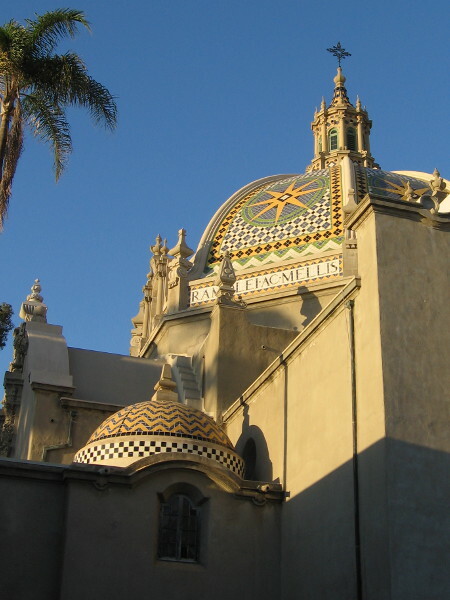 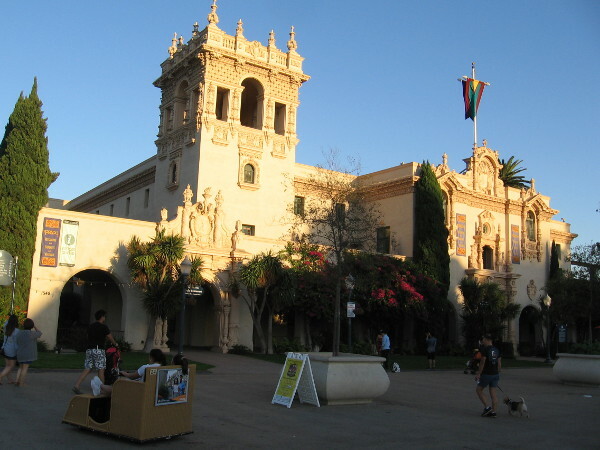 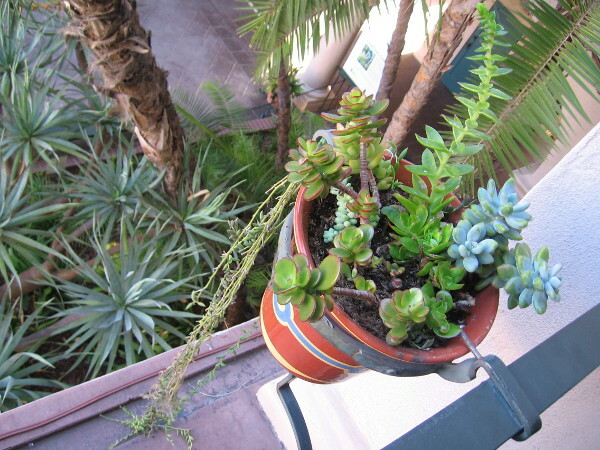 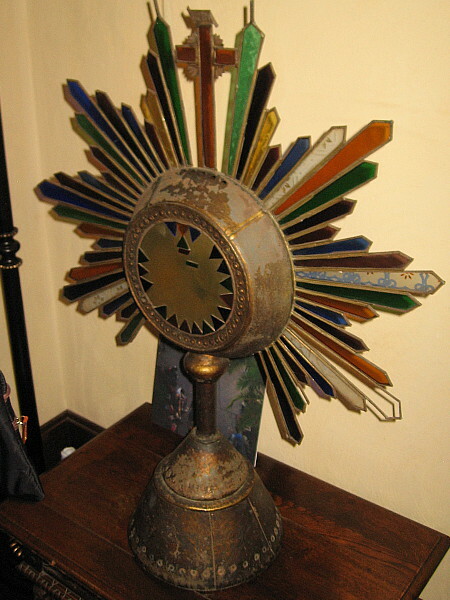 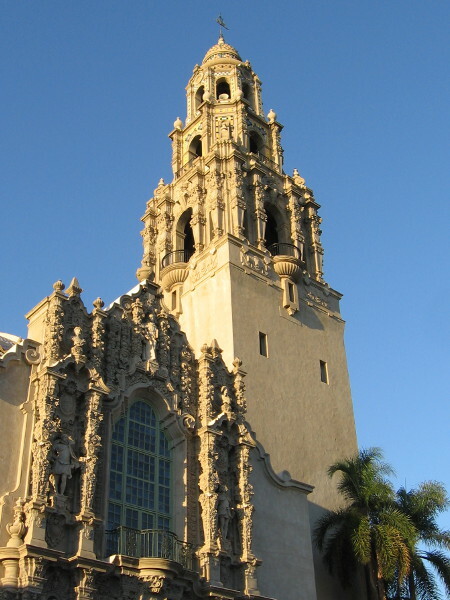 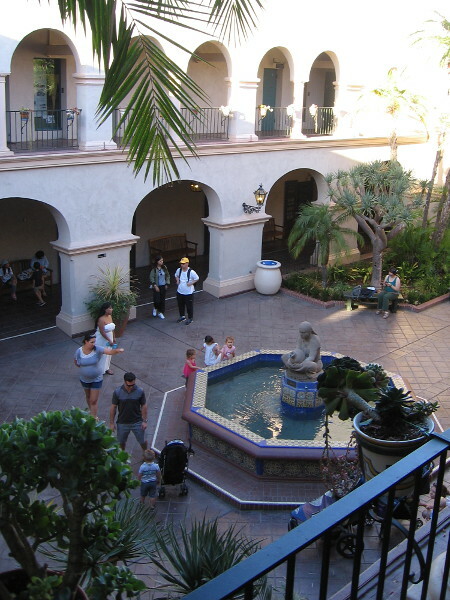 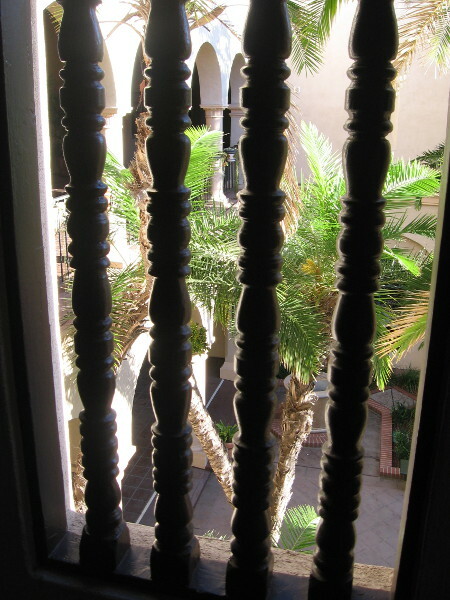 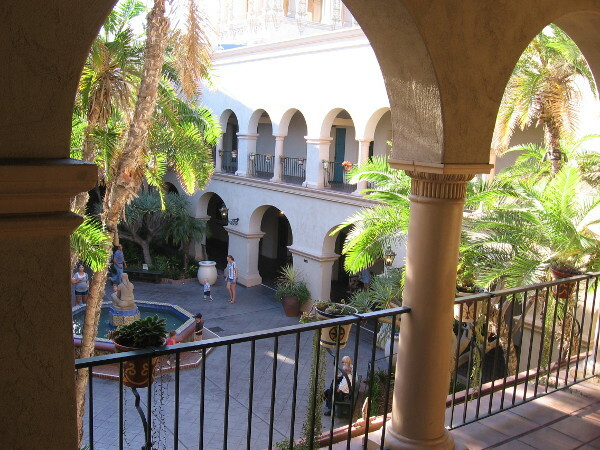 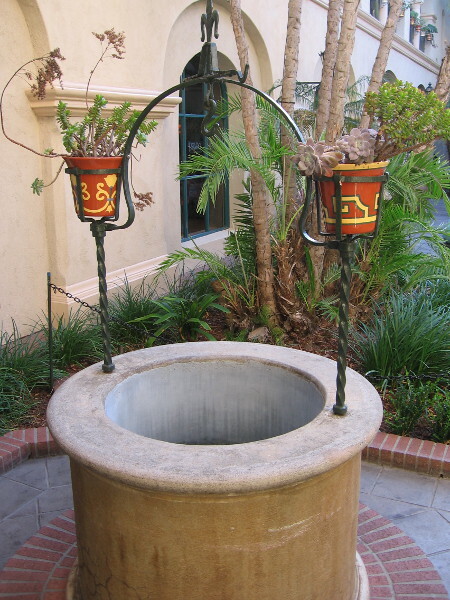 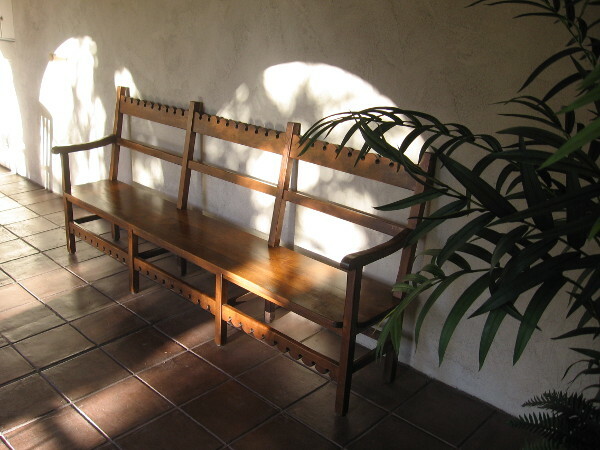 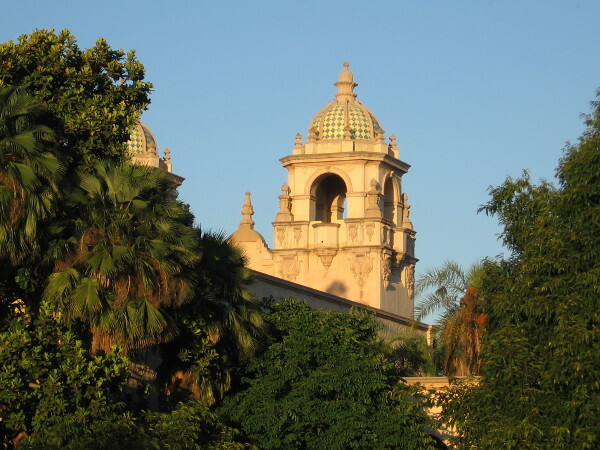 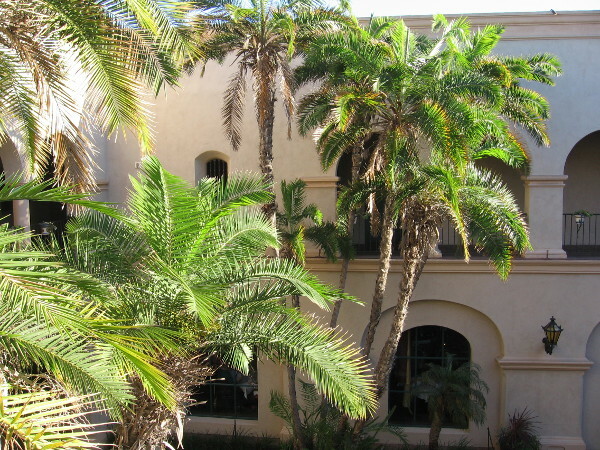 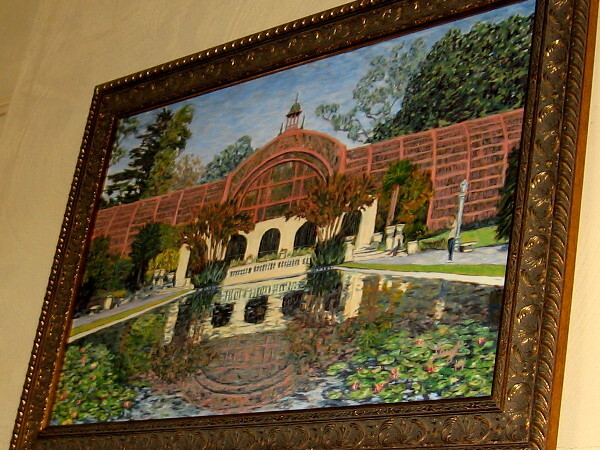 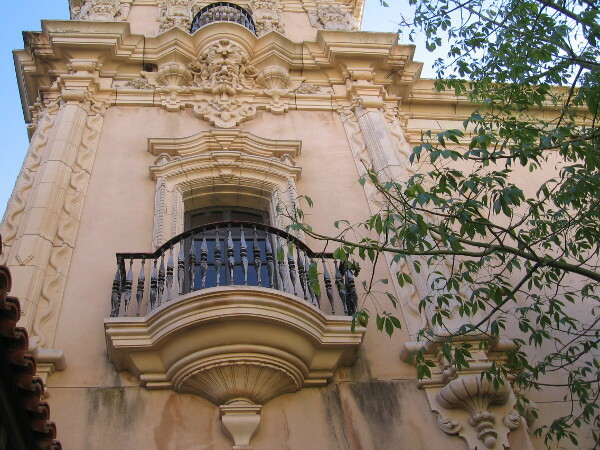 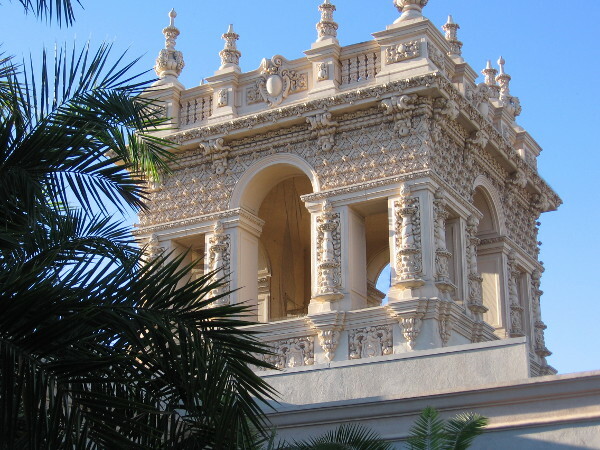 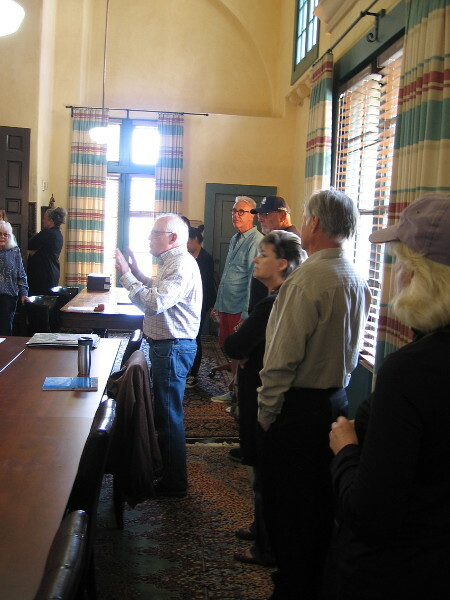 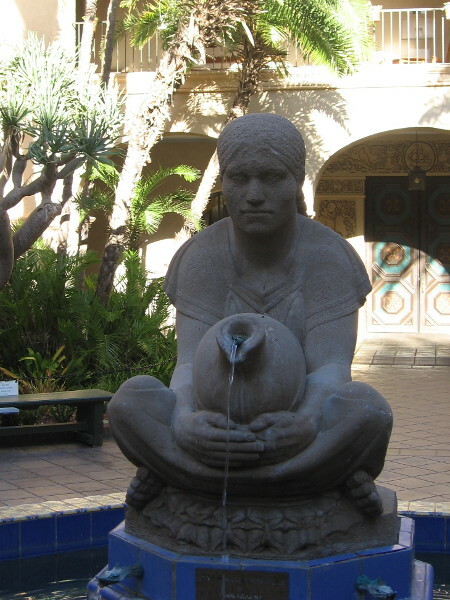 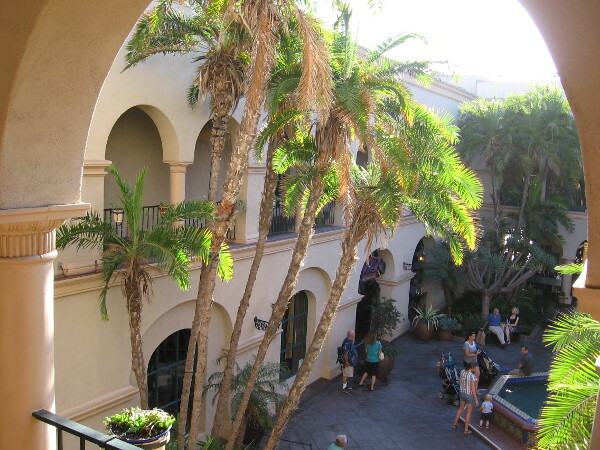 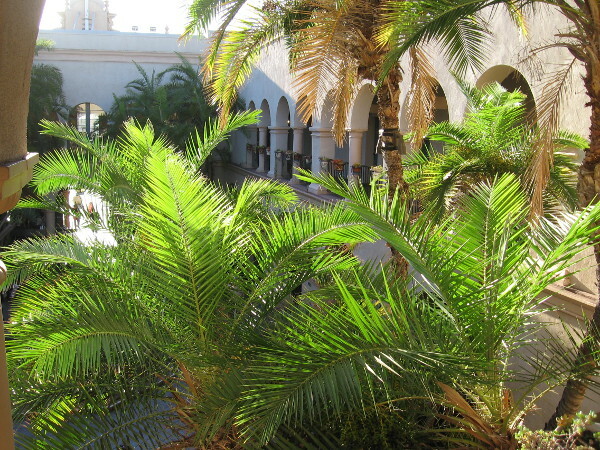 house of hospitality – Beautiful Balboa Park! 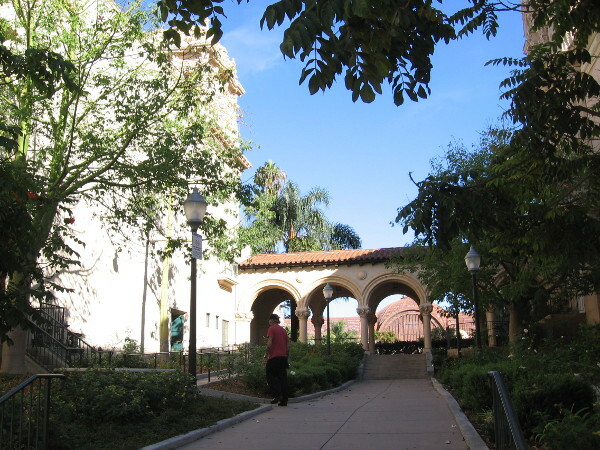 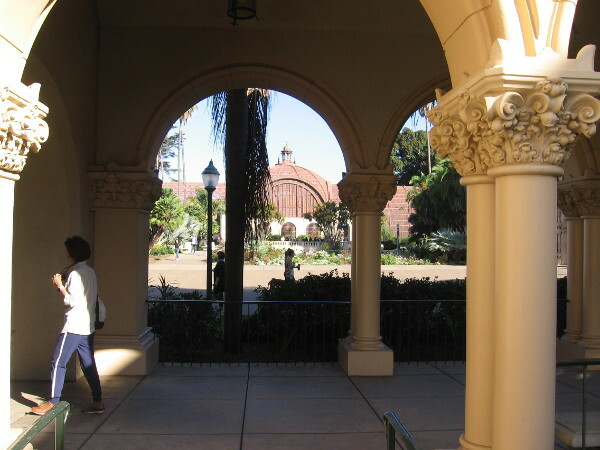 Balboa Park becomes more beautiful one Friday morning. 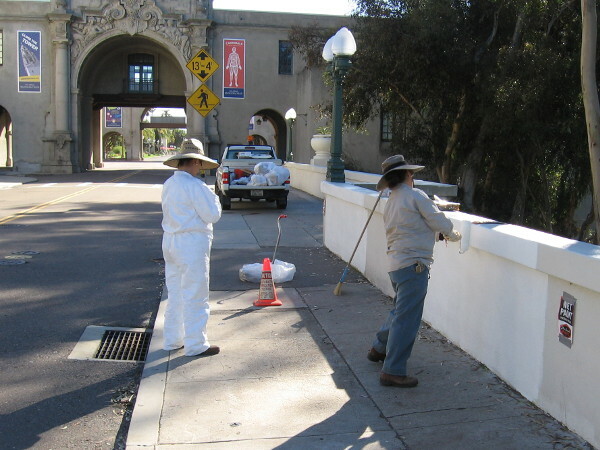 San Diego Park and Recreation Department workers paint a wall in Balboa Park one Friday morning. 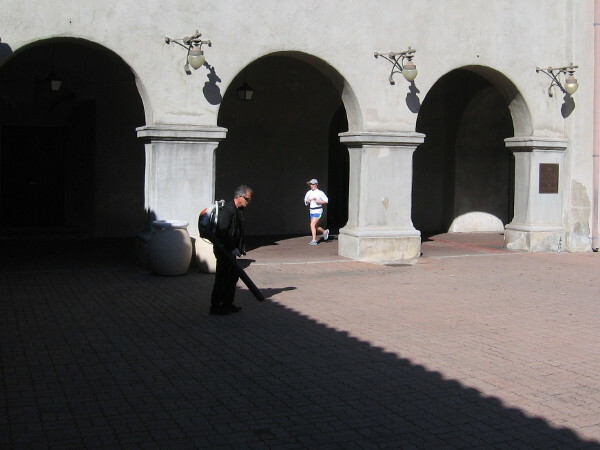 Cleaning the Plaza de California near the Museum of Man with a blower. 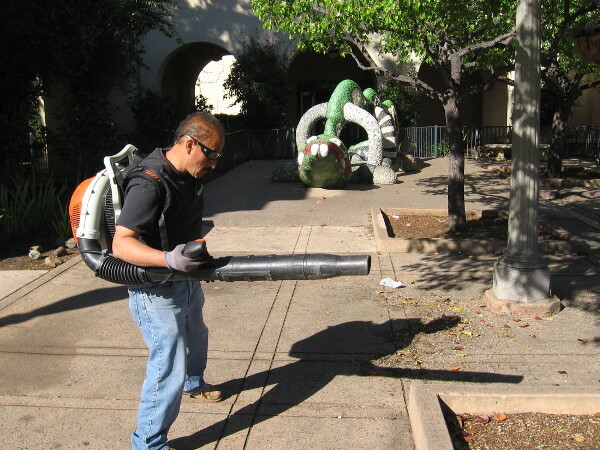 Another worker clears leaves and litter with a blower by the Niki de Saint Phalle Nikigator sculpture. 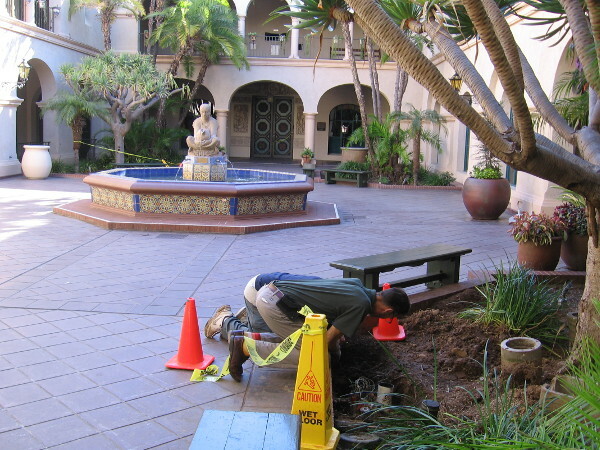 Working on some underground repairs in the outdoor courtyard of the House of Hospitality, near Donal Hord’s iconic sculpture Woman of Tehuantepec. 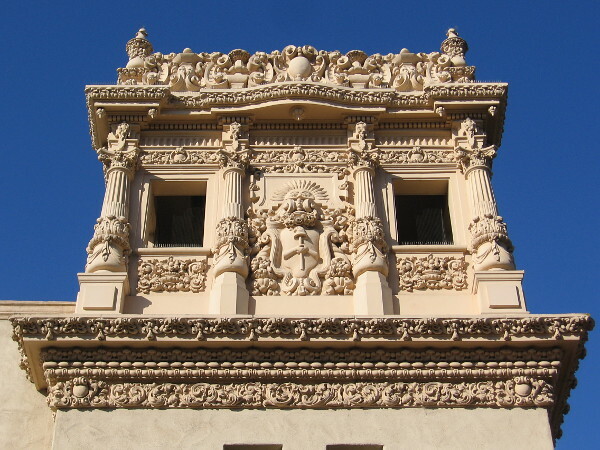 Restoration work if being done on this facade by the reflecting pool. 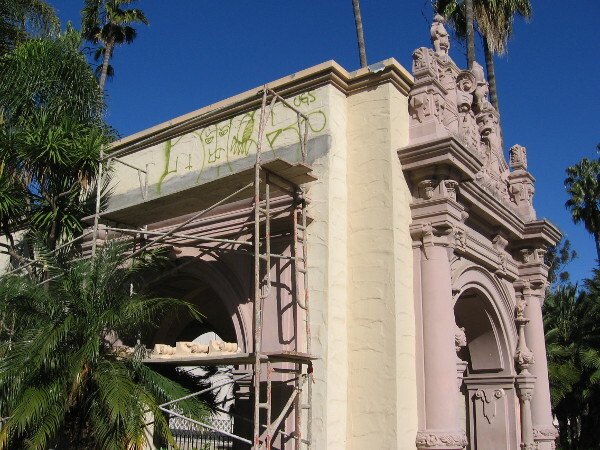 Sadly, a vandal must have climbed the scaffolding and spray painted graffiti. 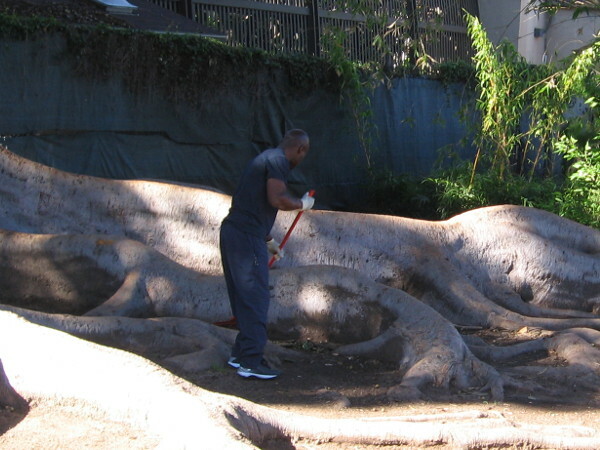 Raking between enormous roots behind the Botanical Building! 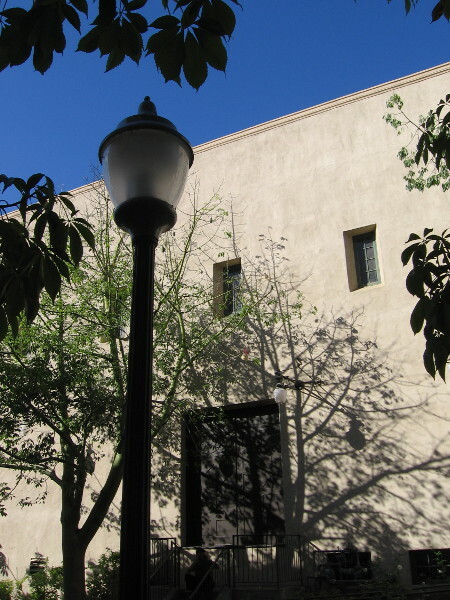 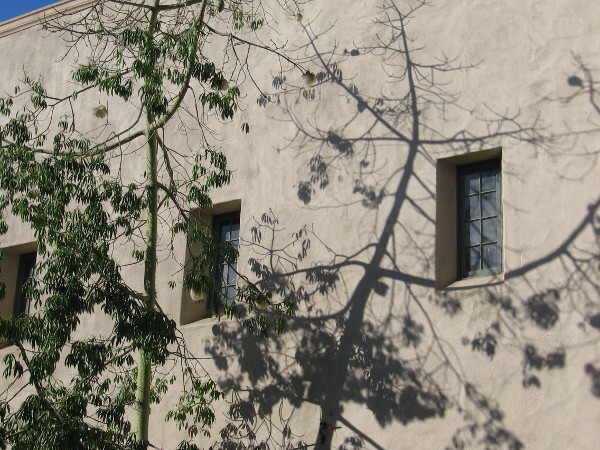 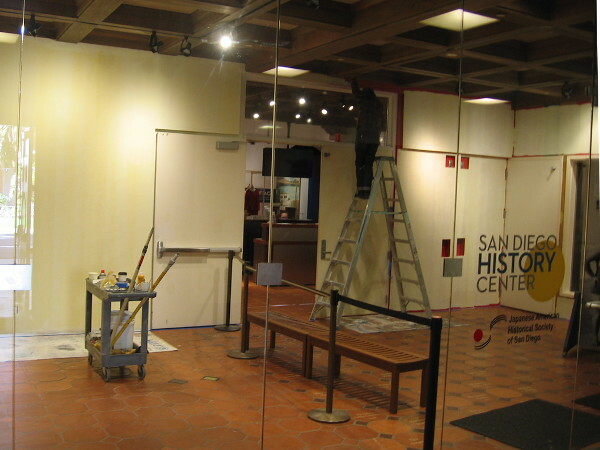 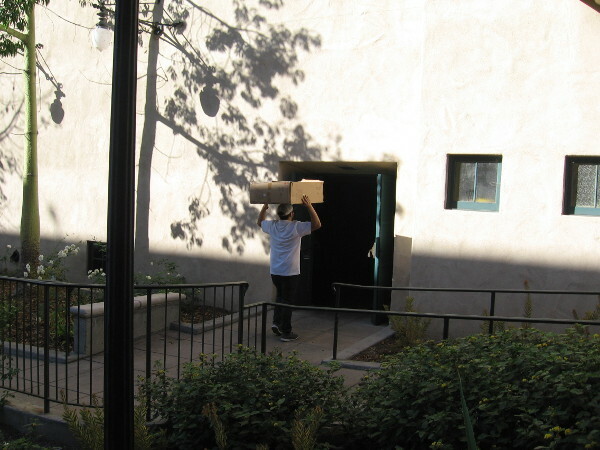 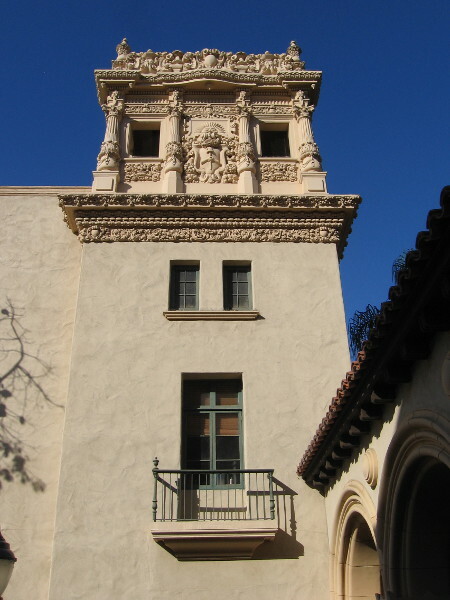 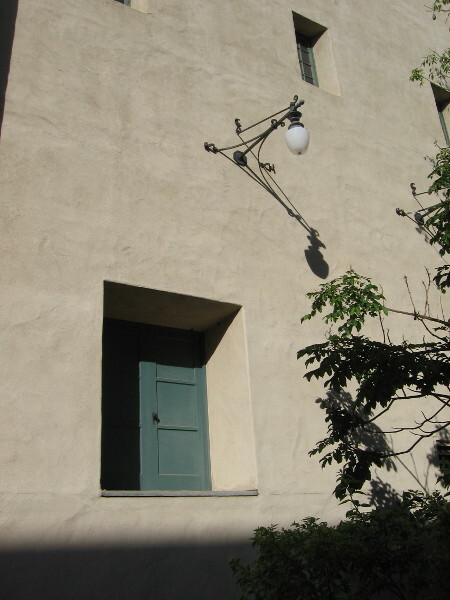 Some work is going on to fix up the front entrance of the San Diego History Center. 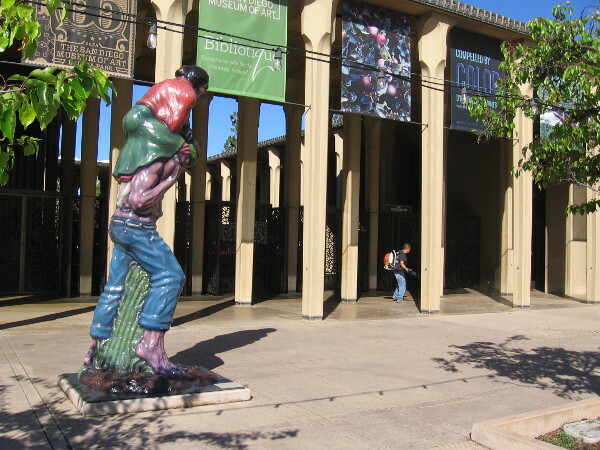 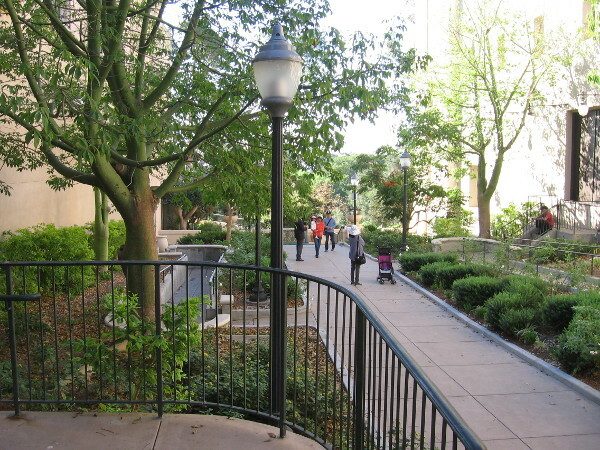 More leaf blowing in the Plaza de Panama near the Museum of Art’s Sculpture Garden Court. 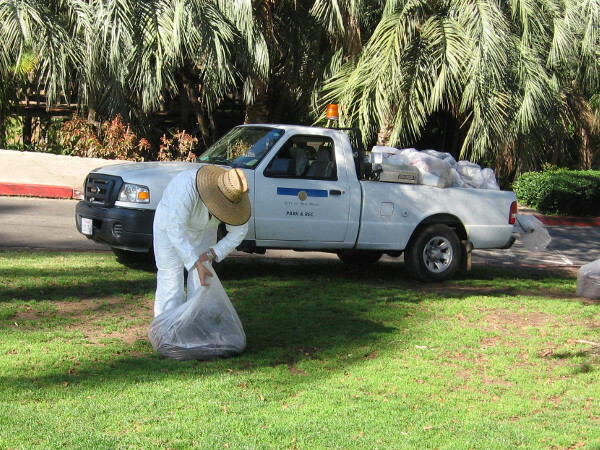 A Park and Rec worker gathers up some garbage one Friday morning, preparing for the inevitable weekend crowds. 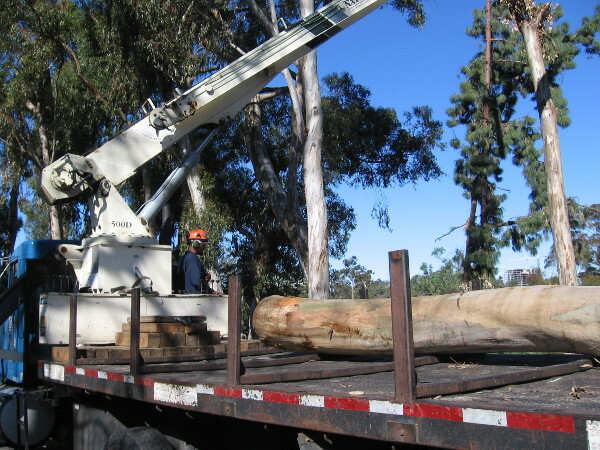 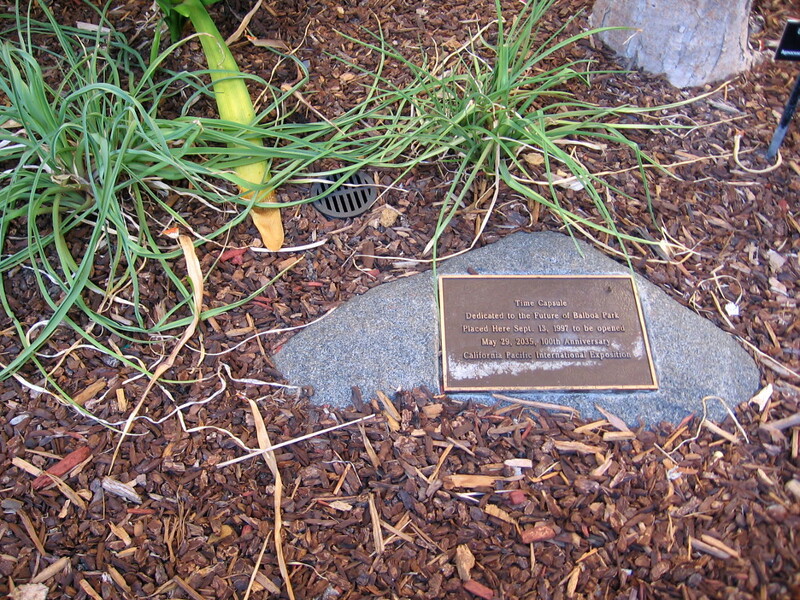 A tree trimming service removes fallen eucalyptus trees in Palm Canyon. 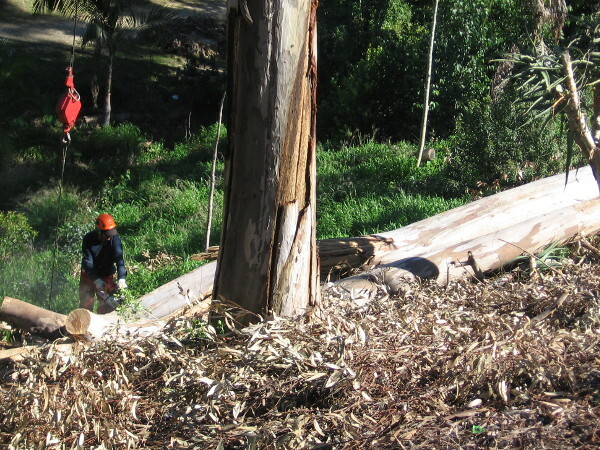 This year’s winter storms have knocked many large trees over. 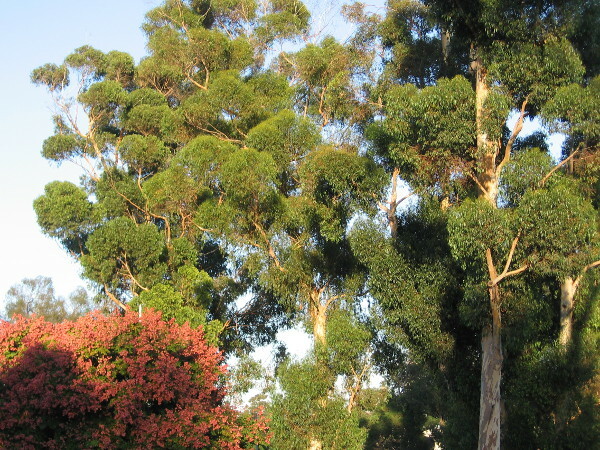 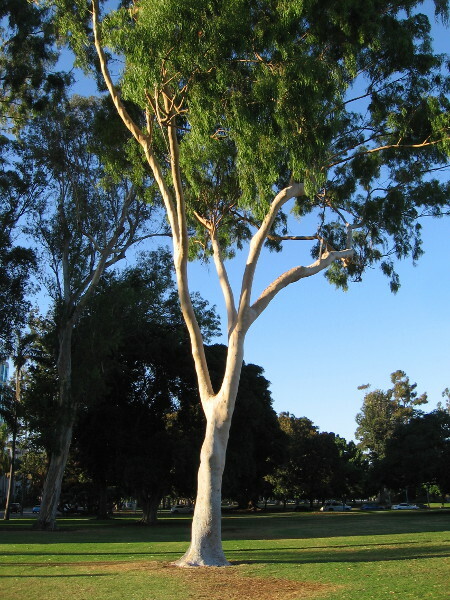 Some of the enormous eucalyptus trunks weigh many tons. 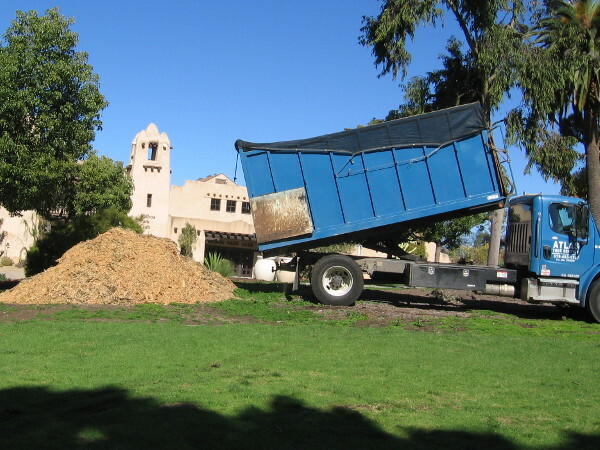 A truck dumps mulch, with the Balboa Park Club rising in the background. 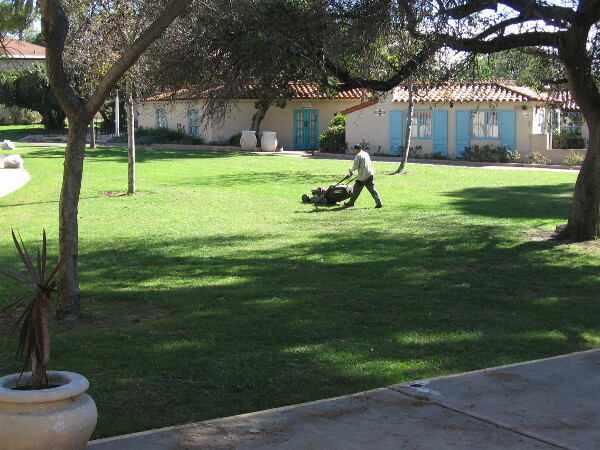 Mowing the green lawn at the International Cottages one quiet Friday morning. 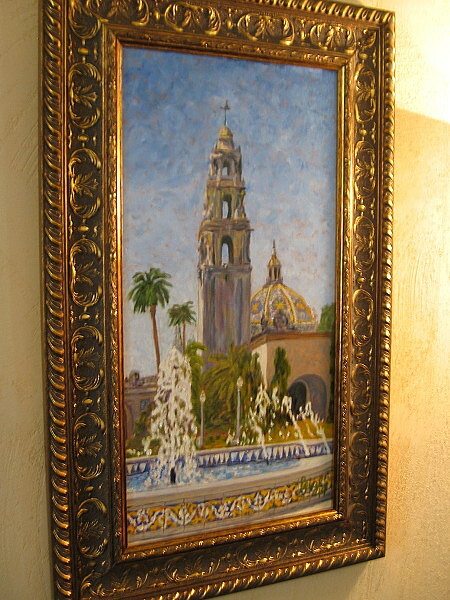 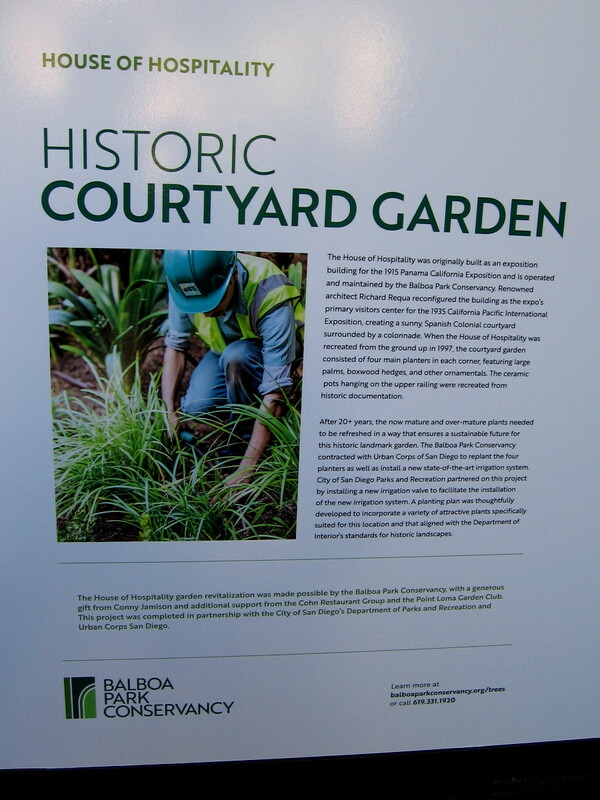 Posted on March 3, 2017 Tags balboa park, balboa park club, beautiful, gardening, house of hospitality, international cottages, painting, palm canyon, photography, plaza de california, plaza de panama, san diego, sculptures, treesLeave a comment on Balboa Park becomes more beautiful one Friday morning.